This ink drawing is the view of the South Grand Island Bridge from Niawanda Park. Below is a time lapse video of me working on this drawing. You'll notice that I don't draw with pencil first, I start with the pen and just draw over any mistakes that I make. Also, in the beginning you can see me making hatch marks where the important shapes are located and then connect them. I stopped the video when I thought it was done but then I decided that it would look more dramatic if I darkened the bridge so that it was in silhouette. I think this could be Framed Ink influencing me. It's more suited for comic book artists or storyboard artists but it has a lot tips about composition, using negative space and other topics that apply to the visual arts. 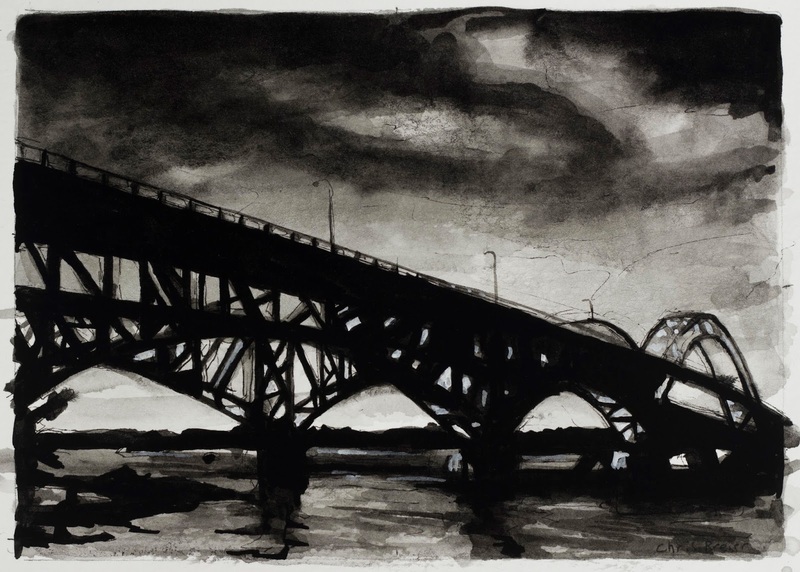 If you liked this drawing you may be interested in other painting or drawings of the Grand Island Bridge.